Samantha Cone has a brother! Congratulations to Nathan and Renata Cone! Maximillian Jude Cone came in at 19 inches and around 7 lbs. 14 oz's. It sounds like the birth went pretty quickly from contraction to MJ's arrival, so you probably can't complain about that. The kid just isn't patient. Of Loyal Leaguers, Nathan seems to be increasing his voting power on the League Board of Directors at a greater rate than the rest of you. Welcome, Max! We're happy to have you onboard! So this evening we headed over to Casa de Peabo to bear witness to the miracle of DNA recombination that is Owen Jefferson Peek. As expected, 01 is quite small. He's a week old and his primary interests seem to include sleeping, occasionally thrusting his arms around as if he suddenly had a good idea, and then getting some more sleep. He's got quite a head of hair, this kid. And he looks quite a bit like his mom. Which is probably all for the best. Adriana's parents were there, and being parents, in the brief time we spoke, they tried to feed us. Nice folks. Overall, it's an interesting thing seeing this crossing of the generations. Both Peabo and Reed are people I've known for a long, long time, so seeing your friends as parents, when you've also seen them in the hallways of middle or elementary school, is an odd, odd thing. You have to take that moment to think "Yes, this is the same guy who wanted to go capture rattlesnakes by hand, but we're going to have to trust that his judgment is now a bit more sound." Even when you know darn well that we may all have jobs and a mortgage now, but we're essentially the same goofy people we were in middle school. And it wouldn't surprise us if, tomorrow we were to find ourselves in the woods again being berated for NOT wanting to use our shirt as a rattlesnake bag by this guy who is now responsible for the care and handling of an entire human being. As fast as time flies, I know that we're probably not too far off from showing up at some of Owen's first soccer games. Or receiving Christmas Cards with photos containing more than one child in Peabo's brood. But when I think I'll be 50 when that kid graduates high school... Well, time marches on. Congrats to Peabo and Adriana. That is one heck of a kid you've got there. I cannot wait for him to attend high school with Carla's kid, who will pummel him mercilessly. And pretty much what you see in the comics. Remember my post on Mr. Silent from a while back? It appears I left the greater Phoenix area all too soon. Phoenix now has its own superhero, Citizen Prime. And, of course, his MySpace page. I was pretty bored in Arizona, so I can only imagine what thoughts would have been running through my head if I had remained in the desert. Perhaps I, too, would have joined Citizen prime in the battle against evil. Perhaps we could have teamed up with others and formed some sort of crime fighting alliance. Could I afford a costume? Was I prepared to take on the menace of crime? Was it going to hurt when the cops shot me? It's really worth checking out this guy's MySpace page to note how many OTHER real life superheroes seem to have linked to his site. Apparently Grant Morrison's prediction that the 21st century would see real-life superheroes is already very much a reality. Also, I would have made Octavio team up with me, using his soccer skills to battle crime. He would always deliver the knockout punch by performing a bicycle and launching a soccer ball right into the crook's head. It would be awesome. And his codename would be: Soccer Lad. And his outfit wiuld be a shiny green and yellow so the crooks would shoot at him, first. Really, it would be worth it to have a whole story about me in the paper running around in a superhero suit simply for the look of utter disappointment on Jason's face. I can't believe it's already out. I can't believe the summer is already here. And I can't bleieve Spidey has already made millions of dollars and it hasn't opened yet in the US. 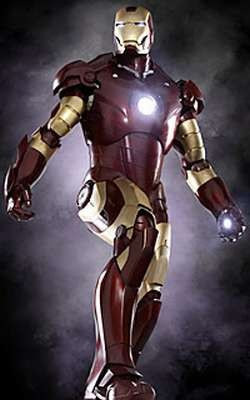 ComicMix was reporting that the movie had already made $30 million overseas. Until you play Phoenix, and then I will probaby cheer for Phoenix. I was surprised by how much I liked the final issue of 52. But now I think Dan Didio is a bit of a moron. I suspect that if I were on the 52 team, I would not care much for the man. For the past few years, the comic series "Little Lulu" has been enjoying a bit of a resurgence among certain comic circles. I've been too invested in DC, some Spidey, etc... and learning about Uncle Scrooge to pay much mind. But after Mike Sterling's post the other day, some of the Lulu I recall reading as a kid came flooding back to me. It is a clever series. Can we do a "League" event at Cannoli Joe's? All bloggers are welcome. I will cover entire cost of the event. I would prefer a lunch and cap the number of attendees at 20. 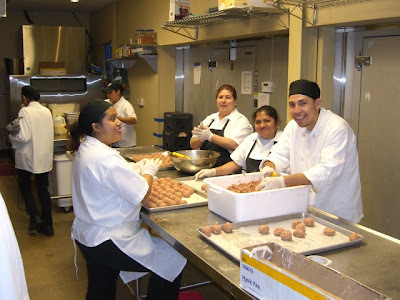 Support your local meatball rollers, Union #270. Part of my initial conversation with Mr. Hauser was that I thought I had a readership of less than 20, and mostly out of town. So my itital thought is: This is terrific, but there's no way we can pull it off. In fact, I think I can count the number of current Leaguers in Austin up to possibly seven. Including me, Jason and Jamie. And one of you just had a baby and probably disappeared on us for the next three months or so. And the one of you in San Antonio has a baby due in, what..? A few days? So you're out, too. So while I think maybe I can dig up a few more folks who would be up for a free meal, I have to get some show of hands to know who could attend an event any time in the near future. I can appreciate the lunchtime scheduling. Hopefully Mr. Hauser could accomodate on a Saturday or Sunday as I'm not sure if I could make it work on a weekday, what with the work schedule and all. Whether you've always been an anonymous reader or whatever, I'd like to see what we could pull together to make this worth Mr. Hauser's time. So speak up. (b) considering my initial post, I can see where Mr. Hauser is coming from trying to get folks to check out his place and make up their own mind. First one's free, right? So in the spirit of fair play and free food, who is up for working with me to schedule a free meal? You know, the dividends the initial post is paying, I shall next complain how Lynda Carter never just stops by (the Wonder Woman suit is optional) and that the US treasury is awful stingy with their gold supply. The League is going on hiatus for a while. 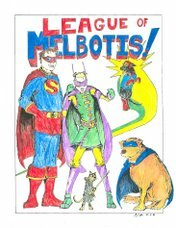 We have a bruised ego to nurse and some imponderables to ponder on the very nature of The League of Melbotis itself. I'm not really sure how to respond to many of the complaints of the past few days as some very valid points were made. That said, I stand by my decision, and that's something I need to think about for a while before we move forward. So readers looking for the post on our visit to Johnny Clambake's will find that I've taken down the post. This was not a decision that I came to lightly. Folks who've followed this little drama know that I was contacted by the owner of Johnny Clambake's. Now, I've been at this long enough and worked on enough blogging projects to know that the internet is a funny place, and occasionally when you discuss someone or their work, they may pop up and argue with you. Some time ago, when Nanostalgia was in existence, I made a stray remark about a web-comic creator, and wound up in an online debate with that creator. It was sort of surprising, but I thought kind of cool. And Lea Hernandez turned out to be really cool. When we were using HaloScan for comments, musical composer "Meco" once commented upon remarks made here about the Star Wars Christmas album. The internet is the world's biggest small town, depending upon what kind of Google Search you're performing. Here's the thing: I'm a big ol' softie. I love people. And I also don't exactly feel like LoM is the blog of record, so I feel only a minor responsibility to ensure my journalistic integrity. And I don't want for some random Google search results resulting in even one of these people to lose their job. Look at 'em. Those guys are all right. Hey, Leaguers. A little FYI. Next weekend sees not just the premiere of Spider-Man 3 (which I will not see opening weekend), but 2007 Free Comic Book Day. In years past, we've visited shops on Free Comic Book Day, but hadn't actually hit FCBD ourselves last year (or the year before, possibly. I can't recall.). Anyway, FCBD is exactly what it sounds like. It's a day when you can get yourself some free comics. In recent years it has also meant that comic shops have been having events in-store as part of the fun. For example, one store in Greenville South Carolina will have a battalion of Storm Troopers and an appearance by Spidey, himself (which you gotta figure is going to help move some Spidey product). Anyway, its now not just dropping in on a comic shop, it's a carnival of comic chaos, and that, kiddies, is kind of cool. Here's some additional information from the Free Comic Book Day official site. Honestly, I have no idea if my local comic shop, Austin Books, or any other shop is doing anything special. We'll see. The trailer has been released for the upcoming straight-to-video DVD release of "Death of Superman" or "Superman/Doomsday" or whatever they're calling it. The copy written for the VO on the trailer sounds like it came from the desk of a WB Home Video intern, or else the studio totally missed the attempt at retro trailer copy with lines like "See! The Amazing Superman! See! Him Perform Amazing Feats!" Anyway, I think if you just look at the footage itself, it looks pretty cool. It looks like the story has been greatly altered from the comics, cutting out all of the extra storylines and, it seems, dumping the "Rise of the Superman" storyline, which leaves the "Return of Superman" storyline in some serious doubt. But he does come back with the Super Mullet, and that's got to be good.